View an Online Demo - See CSS HTML Validator in action. 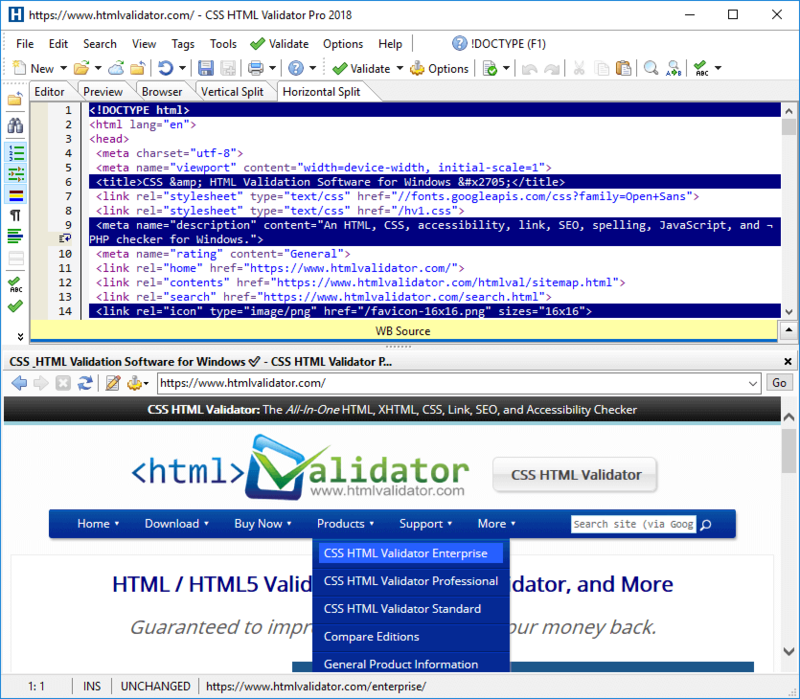 CSS HTML Validator integrates a powerful, lightweight, clean HTML/text editor with a powerful custom validation engine that produces intelligent, thorough, and understandable results. 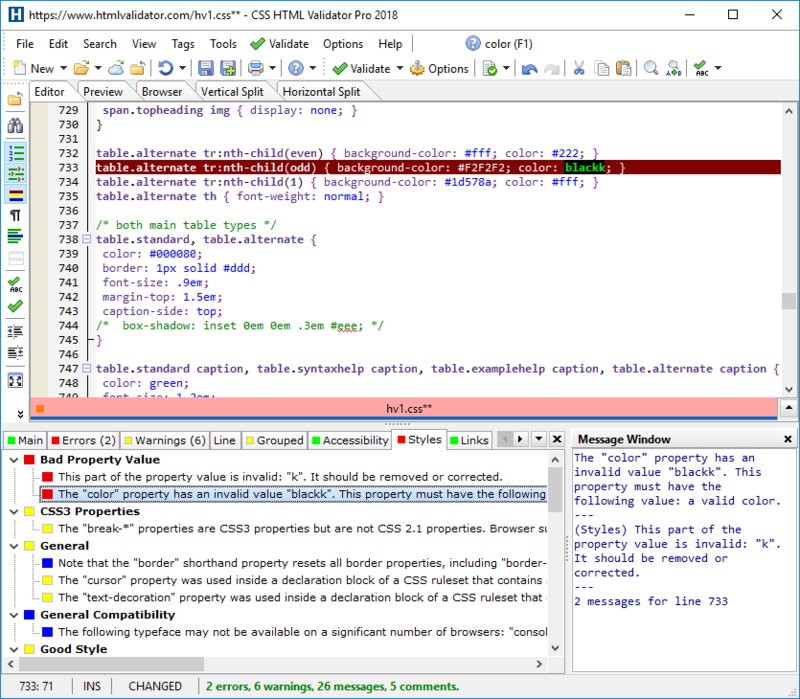 Notice that the line in the document with the validator message is highlighted in red to indicate an error occurred on the line. Notice also that the message in the Results Window (at the bottom) has been selected causing the text responsible for the message to be selected. Use the Pretty Print & Fix Tool to automatically format and fix certain HTML problems, convert HTML to XHTML, and reformat/pretty print HTML and XHTML documents. CSS HTML Validator is extremely configurable. Many validator messages can be individually disabled or the message type can be changed to suit your specific requirements. 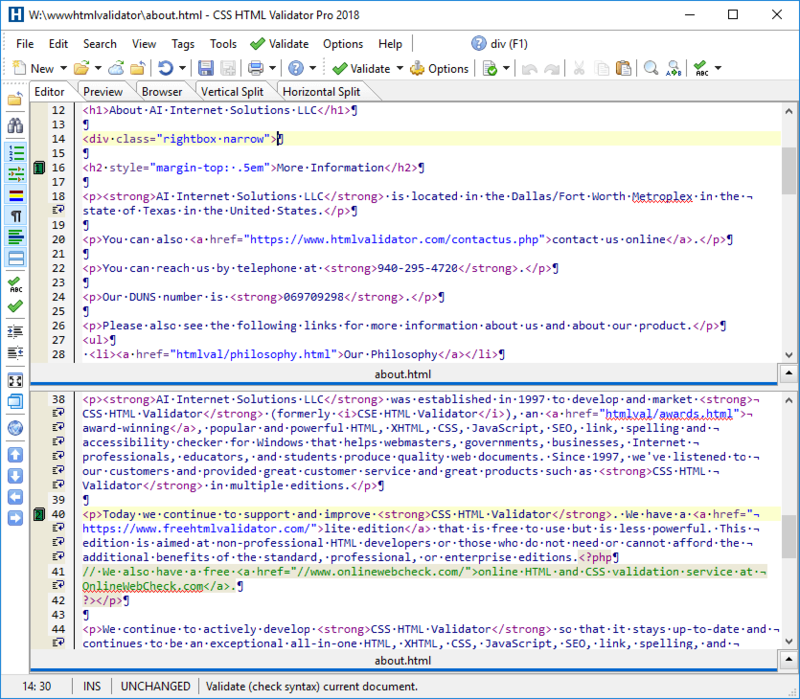 The above is the editor with the Resource and Results Windows hidden. 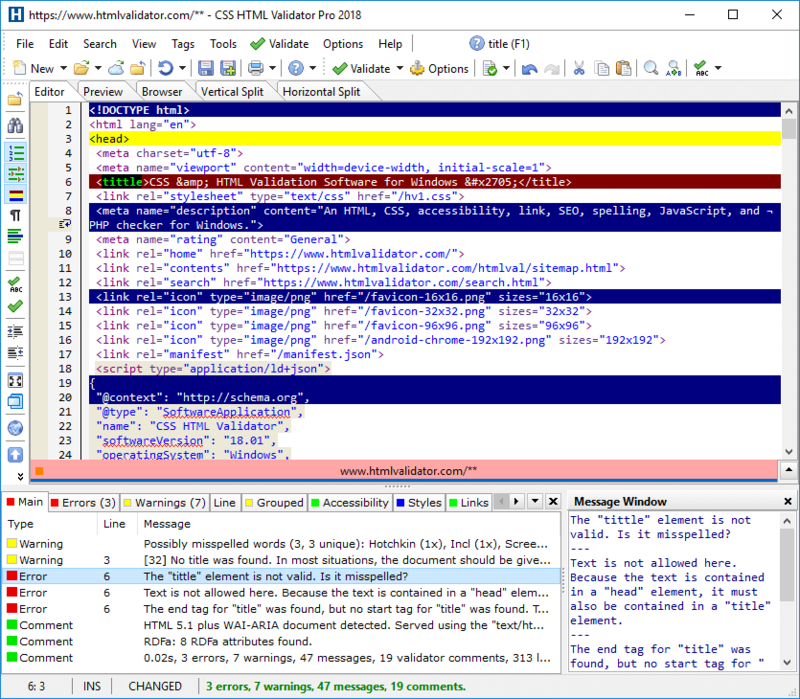 It shows the editor with these options on: line numbers, bookmark gutter, word wrap (with wrap symbol displayed), and horizontal split view mode. Notice that with split view mode, you can easily edit two documents simultaneously, or two different parts of the same document. Notice also that bookmarks are being used (see the gutter) to quickly navigate to bookmark positions. CSS HTML Validator Standard, Pro, and Enterprise include an integrated web browser (requires Internet Explorer). 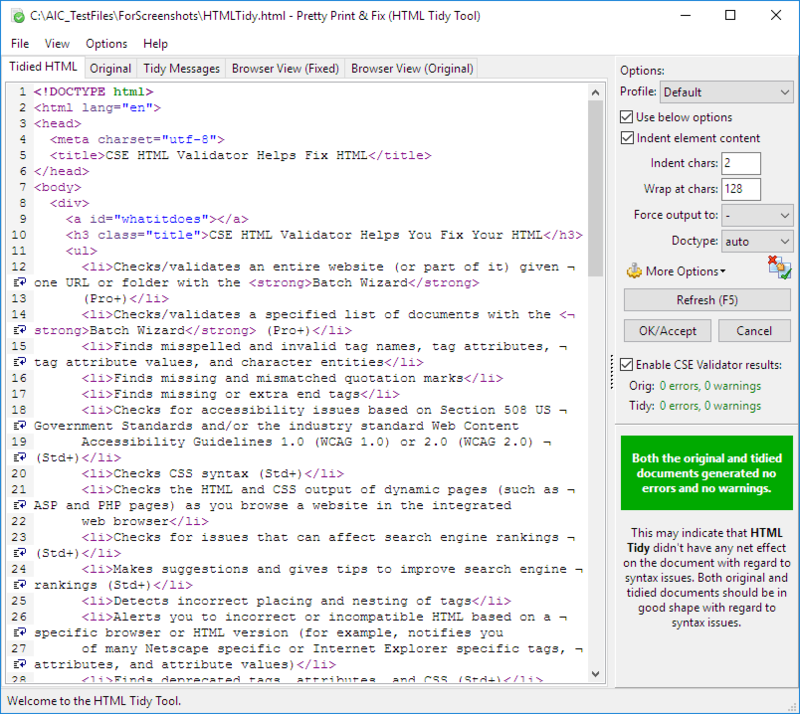 Browse the web with the integrated browser and HTML Validator simultaneously displays the HTML source of the page that you are viewing, and can automatically validate web pages as you browse the web. This is great for testing the output of dynamic pages that use ASP, PHP, CFML, or similar technologies. The integrated browser can also double as a browser preview for the document that you are currently editing. CSS HTML Validator also checks for accessibility problems based on WCAG 1.0, WCAG 2.0, and/or Section 508 US government requirements. The Accessibility tab shows the results. 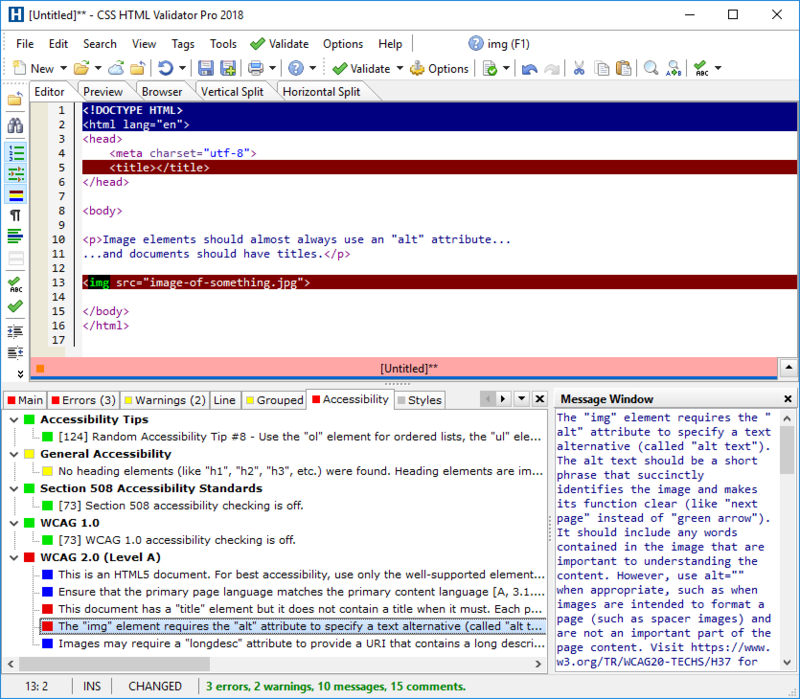 Accessibility checking is configurable and can be enabled or disabled. CSS HTML Validator also checks CSS syntax (including CSS3). The Styles tab shows the results of checking CSS syntax. CSS HTML Validator not only checks external style sheets but also checks inline styles and embedded styles in HTML and XHTML documents. CSS HTML Validator also checks HTTP, HTTPS, and other link types. Link checking is done automatically (if enabled) and in the background whenever you validate a document. The powerful Batch Wizard, which is available in the professional and enterprise editions, lets you create a list of targets and then validate all of them at once. The targets can be files, folders, or URLs. A single or multiple report in HTML format is generated with the results of all the targets. The Batch Wizard can also follow links when validating or link checking.